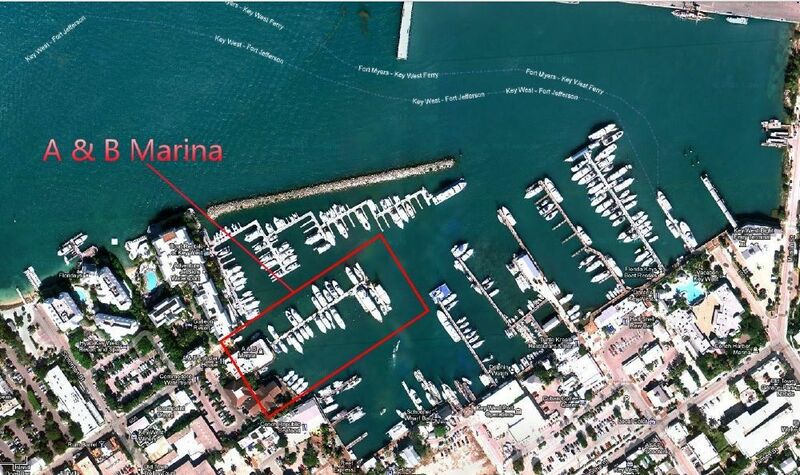 24° 33' 43.9" / -81° 48' 8.7"
To the right is a detailed image of A & B Marina as you enter Key West Bight. Red day marker #4 is at the entrance to Key West Bight near the end of the rock Jetty. Hail us when you reach the Bight and we'll give you your slip assignment. Below you will find a detailed diagram of how to properly tie up to the dock in a “Stern-to” configuration. You will need 2 Bow lines, 2 Stern lines and at least 1 Spring line (Larger vessels may require 2 Spring lines). Please note to use a slip-knot around the poles and keep the bitter end of the line toward your vessel. Should you need assistance, please don’t hesitate to contact us anytime. Updates from Key west in your inbox!